Our principal activity consists in the systematic documentation and habitat characterization of the unknown depths of the Azores Archipelago, between 300 and 1000 metres of depth. First, multibeam sonar surveys are carried out in pre-defined areas, to detect potentially interesting spots. Then, transects are defined to carry out georeferenced video surveys with the LULA1000 submersible, with the aim to systematically document habitats and fauna. The results of those survey transects are used for scientific and educational purposes, as well as for nature documentaries. Each dive brings new knowledge and images of species that have been rarely or never before documented in their habitat. During the dives, additional oceanographic data are collected: CTD (conductivity, depth, temperature), pH, oxygen, turbidity, tracking data, samples of organisms. 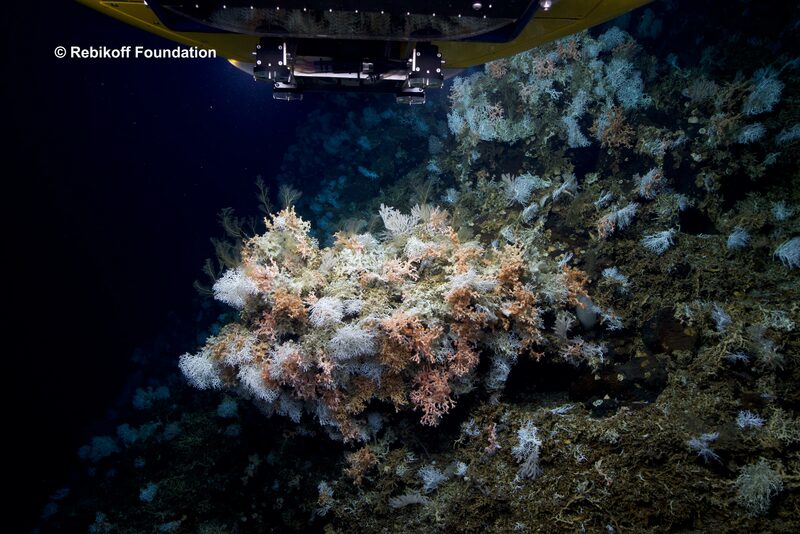 During our several-day expedition to Condor Bank and the sea area west of the Capelinhos volcano, off Faial Island, in august 2018, we discovered an extensive and diverse coldwater coral reef in 930 meters of depth! The dives beween 150 and 1000 metres also revealed several coral gardens and deep-sea sponge aggregations.